Why: The stock rear toe links on the LS430 are a significant cause of inner tire wear and even worse the inner subframe adjustment mounts can become damaged making an alignment a crap shoot. 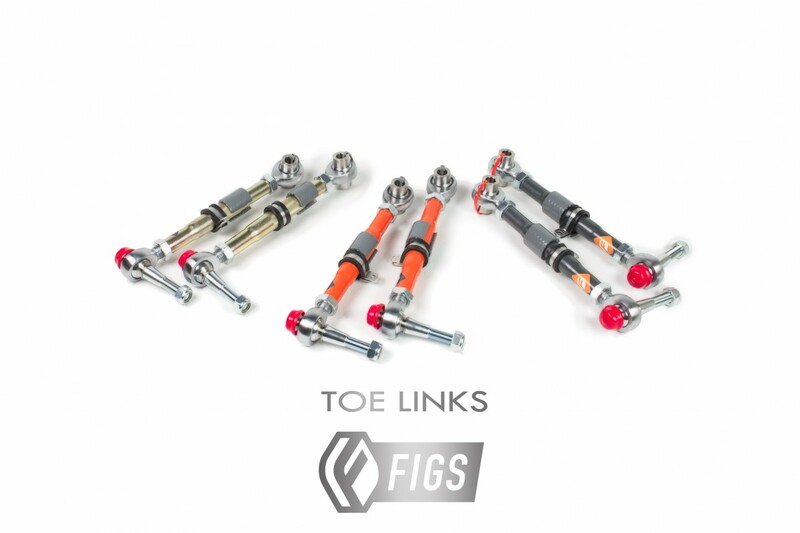 FIGS has taken a long time to develop an OEM quality solution that allows easy adjustment, long product service life and the most control over the rear toe geometry of any similar product on the market. We maintained the strength of the system with absolutely no weldment at the rod end interface unlike cheaper alternatives offered by import companies. That means a carbon steel or chromoly single piece thread stud integrated with the bearing for maximum strength. Tapered studs are precision machined from 4140 chromoly then heat-treated to maximum strength. Finally the are zinc-plated to keep them from rusting. 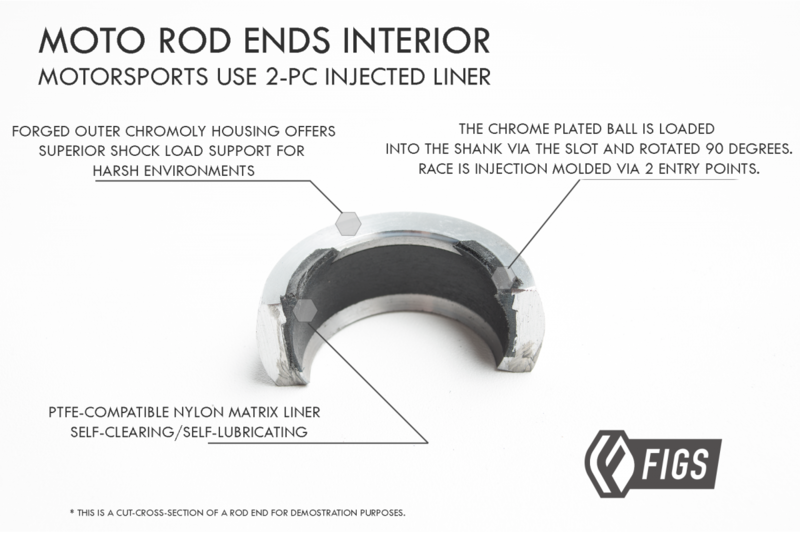 FIGS designed our own tapered studs for maximum clearance of the rod end during travel yet close enough to the mount to not incur unnecessary additional bump-steer. 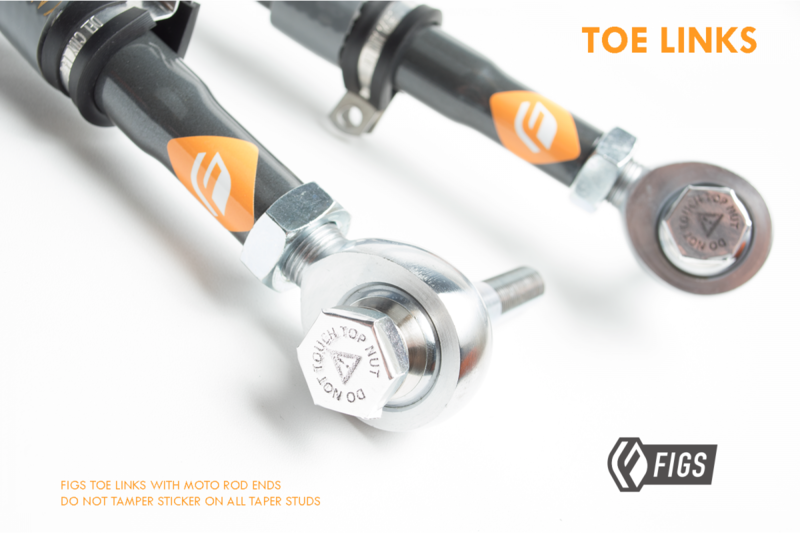 Toe Links from FIGS also allow serviceability should the rod end wear and need replacing. These compliment the MEGA arms by providing a balanced rear steering strategy under bump, making them an obvious choice for discriminating race teams and club cars. Location: Front-side middle of rear suspension. Length adjustment of up to 1.5" without removing from vehicle. Increases the arc length of the rear toe linkage to reduce bump deflection. 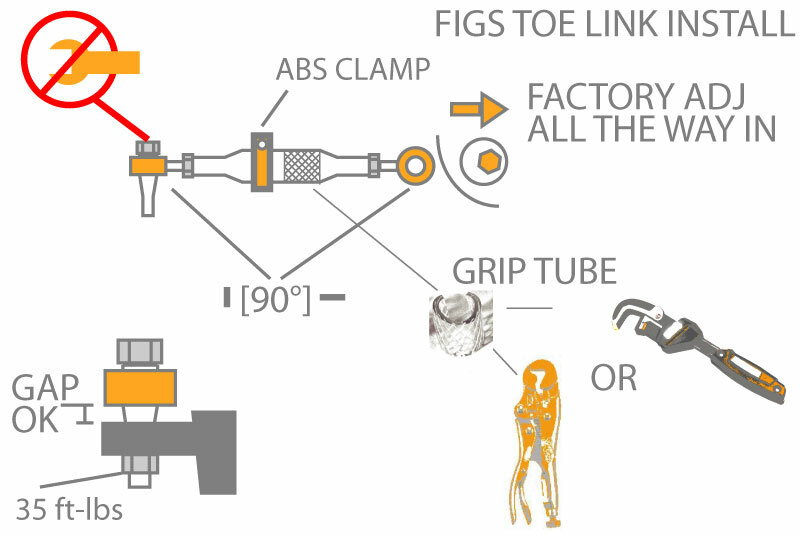 Infinite fine toe adjustment to overcome stock eccentric mounts that are warn or bent. 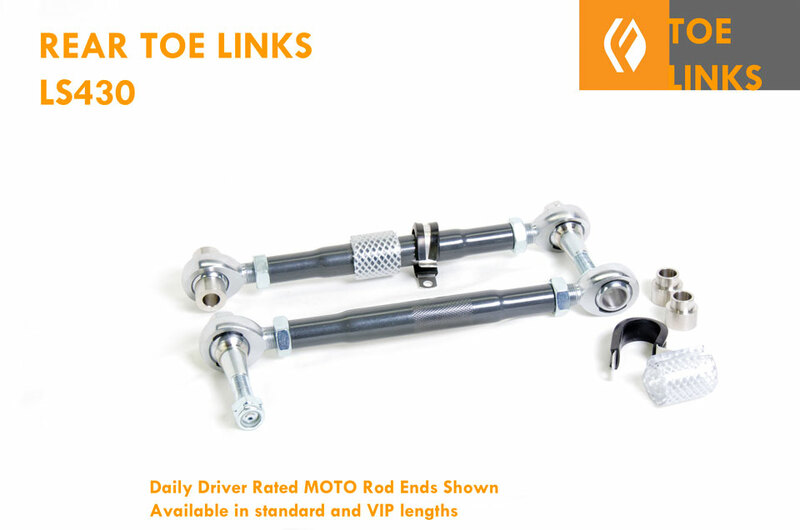 MOTO and Precision rod ends provide the strength for Daily driven cars and Track vehicles. Top quality materials and workmanship mean you are buying the best product on the market compared to low quality competing parts. No welds at the bearing interface, premium bearing options for long service life. Economy( 2-P) LIGHT DUTY, Slot Injection Molded Race (2-P) MOTO DAILY DUTY and Precision (3-P) Track Duty rod end choices, PTFE lined. 4140 Chromoly tapered stud assembly is stronger than stock ball joint. SUS303 FIGS rod end spacers for precision chassis mount. Swaged 1" SAE 1012 steel tubing for reduced weight and increased strength. Knurled for grip and yellow zinc or Black Dichromate finish for corrosion resistance. 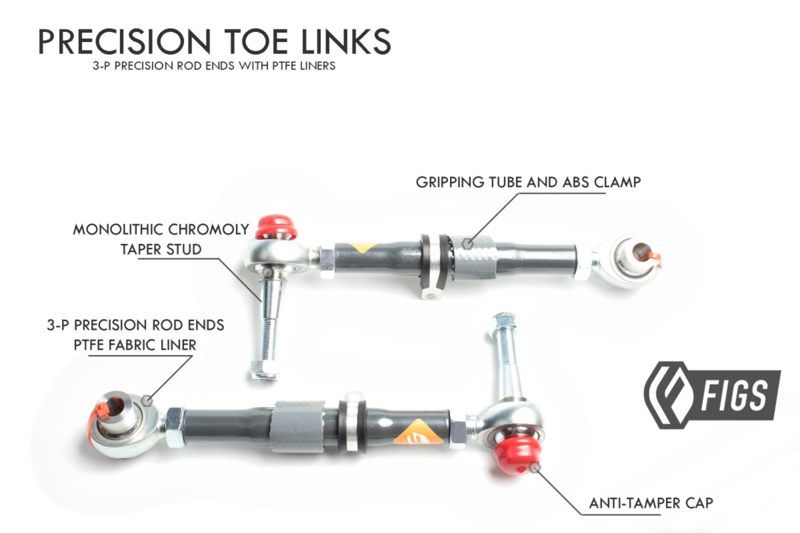 Includes tubing for alignment gripping and coated clamps for ABS sensors. Rubber Boots available as special order. NOTE that this means more maintenance. Rubber boots require that grease be packed inside the boot to prevent the rubber from interferring with the rod end race. FIGS strongly suggests MOTO rod ends for daily driven cars due to the shocks loads of daily driving. Econ rod ends may experience shortened life cycle due to rough road conditions. Contact FIGS for more information or questions. We have been testing these for a long time and due to time contraints it has taken us a while to p.. 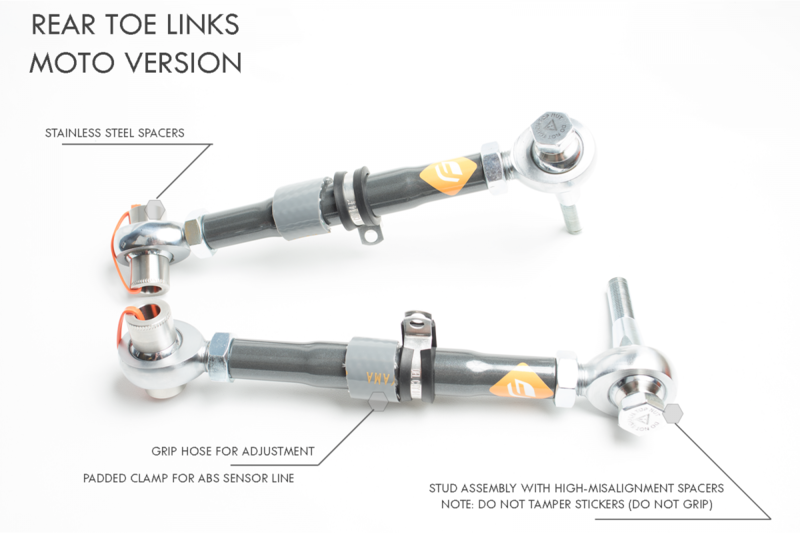 This is a full rear armset replacement including LCA, Toe, and Trac links to acheive up to -10 deg..
We teamed up with the makers of the F-sport sway bars to make our own final run of rear sway bars fo..